Many schools assign summer reading, and most students wait until the last minute to do it. 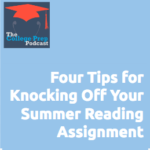 Tune in as Megan and Gretchen provide four tips for getting a head start on your summer reading, and getting it done well before the due date. You might also find this helpful: Gretchen’s video series about how to read a 400 page book in 2 hours.